Excited mentors and new speakers at the Global Diversity CFP Day in Berlin! Even if you have tons of experience as a conference speaker — make sure you take part in the next global diversity CFP day. 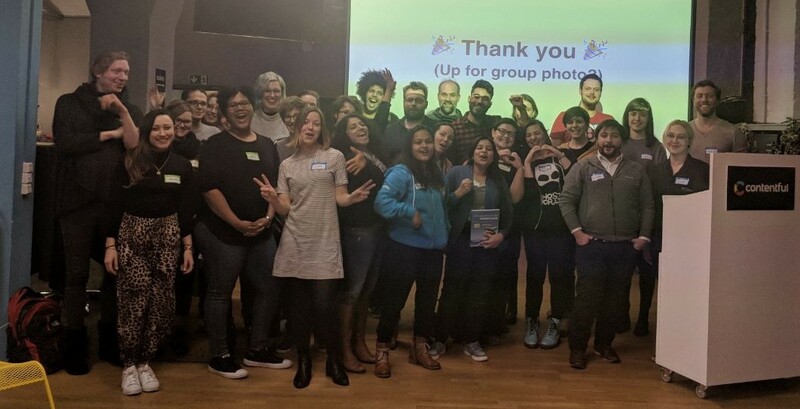 All of the world, in over 50 cities, people gathered for a whole day workshops to contribute to more diverse conference line-ups. Newbie speakers are encouraged and coached to put together talk proposals, and more experienced speakers also take part to mentor and give advise. Florian Gilcher: How do conference review committees work? Personally, what helped me when I was new as a speaker, was a couple of advice about nervousness and forgetfullnes. I’ve never heard about anyone that saw a nervous speaker, and then came to the conclusion that the speaker was stupid or didn’t know what they were talking about. The typical reaction, when seeing a nervous speaker, is empathy. You feel for the person, you’re cheering on them, because we all know what this can feel like. So don’t worry if people notice that you’re nervous — it just makes you more relatable. The other thing people are often worried about is “What if I forget what I was going to say?”. But if you think back at the best talks you’ve heard, it’s not about the totality. What stands out is typically one example, technique, tool, joke, story or whatever. If you forget what you were going to say, just take a pause, and move on to the next part that you do remember. Most people won’t notice that the transition was a little weird, and if they do notice, they will probably think that it was because they themselves weren’t paying attention! This is a really nice intro video making the idea of getting into giving conference talks less intimidating. Speaking at conferences is a great opportunity to meet great people and also improve your career. What do you want to learn? Sometimes, the best way to learn something is to teach it. Write a talk about it — then you have to learn it. People who are new to a topic are often better at explaining it than people that are more experienced. So don’t be afraid of doing a proposal on a topic where you’re not an expert. It also doesn’t matter that someone else has talked about it before as long as you make your spin on it. The rejection is often quite generic, and that can be discouraging. But a lot of times, you can actually ask for more specific feedback. Don’t miss out on this learning opportunity! A typical way of doing the proposal reviewing is to first do one round of anonymous rating. Then the lower 50–70 -percent are cut, depending on the number of proposal. In the last round, the remaining proposals are de-anonymised and they start puzzling it out a schedule. They can have 5 great talks from really experienced speakers, but do we have room for them? Would be want to have more newcomers in? Florian get 180+ proposals, and JSConf get more than 500. So you need to stand out. You can’t just have a general technical topic. You need to write for someone that’s really tired and on their fifth coffee. A quite common topic can be great, but then you need to make it clear why you are the best to talk about it. Give your spin it. Talks aimed at beginners are rare — and important. So you can often stand out by writing a proposal aimed at beginners. If you’re aiming for beginners, but that into your proposal if there’s no check box for it. For most of the proposals, the reviewer won’t actually know the topic really well. So also ask someone who doesn’t know your topic to look over your proposal. But still — abide by the rules. Deliver a proposal that follow the instructions in format. Danielle works in an organising working to have more diverse speakers. In this video, she gave advise of crafting your bio. This is something people often find really scary — to talk about them self — or well, brag about themselves. The bio should make it clear why you’re the right person to give this talk. What have you done? What projects have you worked with? But because this is difficult to do, ask for help. One of the techniques is to pair up and interview each other, and craft a bio based on the most interesting tid-bits from the interview. We did this in the workshop, and it worked excellent. What the coolest thing accomplished? Wthat are you a product of? What are some of your talk idea? Why? Why you? Whats important about you that’s not in your resumé? This was a really interesting discussion. What are the things we say, and things we do, that contributes to creating an environment at conferences more or less inclusive? By the end, both groups presented some of the examples they came up with. But for me, more than the list itself, the value lies in the actual discussion. Hearing other people’s experience makes it easier to empathise and be mindful of these issues. Still, here are some couple of examples (for more detail, check out Amber Wilson’s excellent summary). We talked about how phrases like “guys” or gendered pronoms using words like crazy/autistic/insane to describe something can be exclusive. Also making sure your slides are accessible, e.g. considering colorblindness, epilepsy, font sizes, contrasts etc. Equally interesting was the thing about being respectful to people are new to the field or might belong to different field that your own. We were a quite diverse group, and my impression was that our shared main take-away was that you have to be aware, mindful and humble about the fact that you can affect other people with the way you talk and behave. Check your privileges. Saron Yitbarek isthe founder of CodeNewbie. She has a lot of experience coaching first time speakers because of her work with Codeland. This was an excellent video. Watch it! A tech talk is not a lecture. Lectures are boring. It’s not a soapbox. Don’t just rant. It’s not a blogpost. A blogpost is often useful, but where’s the human element? It is, however, a performance. It’s more like theater than anything else, but stilling being informative. And because it’s a performance, and you need this human element, you should make sure that there’s an emotional connection. What is something that I’m proud of? What have I learned that made me excited enough that I’ve shared with a friend? What’s a project that I struggled with? People often think that talks have to be about success, but typically the talks that get the best feedback are about struggles and failures. You need to find an angle that makes it personal (why are you giving the talk?) but also makes it clear that it’s a story that should be told as a talk (and not just as a blogpost or a video). (Watch the video for Sarons really funny cookie dough ice cream example). Even you find an angle, how do you then set forth to structure it? Lessons learned or technical details sounds useful, but isn’t really that engaging. What you need to do is tell a story, and weave in the lessons learn and technical details into your story so it has context and becomes engaging. (Don’t just split the talk in three: story/tech/lesson — it has to be weaved together, maybe think of it as three smaller, connected stories). By following a structure like that, it’s easier to make it truly an performance, that is both informative and emotional. Then, we watched a nice intro video about slide design from Melinda Seckington. Here’s a quick write-up of her main points. Slides are there to help your advice audience absorb the information. There is no one true way of designing slides, but here are 4 principles that can help you craft your slides. Focus on one purpose per slide. This makes sure that the slides are as relevant as possible at what you are saying at this time. This mean that you shouldn’t use your slides as a tele-prompter (you can use your presenter notes for that). Also, if you have a bunch of resources, you can gather them in a blogpost and share this one link instead. If there’s too much stuff on your slides. e.g. text, people get distracted. For instance, it’s very hard to read and listen at the same time. You are more likely to notice something that is notibly different, in effect, creating contrast. Colour, shape and size are three efficient ways of doing this in your slide design. People absorb things better if they hear and see things that are connected. Photos need to be relevant if they’re going to help perceptful. Make sure the photo and what you’re saying is truly connected, and that the photo isn’t just decoration. Icons can strengthen your points, take a look at the noun project. Use consistent design with slides with the same purposes. What are the kind of slides that are in your presentations? It could for instance be slides made specifically for headings, definitions, lessons, examples, etcetera. This also makes it easier for you to create slides later. How long is your talk, at what time and where? Hardware is a chapter all in itself. Do you need to bring your own clicker? Do you need to bring your own adapters? And of course — always have backups. In the cloud, on your laptop, on a memory stick. You can never have too many! Show up early, so that you can go up on the stage, get a feel of the room and double-check the technicalities. You can even practice the “getting on stage”-part of your talk. Oh god, where do I look? A sea of people can be pretty intimidating. Try to talk not just to one person, but to look at them all. Everyone goes too fast the first time. Don’t worry. If you finish early, noone’s going to be upset. Also, a couple of minutes over, is also ok.
Once you get on stage, you get an aura of expertise. People already think that you know what you’re talking about, and that’ll help you. Don’t point it out, just keep going — most people won’t notice it. If the question is really complicated, it’s completely OK to say “I’m not quite sure, let’s talk about it afterwards”. And also, for the infamous “This isn’t really a question”-questions (the show-offs), you can call them out on it. “That’s an interesting discussion, but this is really a Q&A session, we can take the discussion in the break”. Q&A is typically optional, and you can ask the organizers to not do a Q&A after your talk, if it really stresses you. I got so much out of being part of the global diversity CFP day, and I really hope even more people will take part next year. It’s such a constructive way of dealing with the indiversity in the tech community — and I hope efforts like these will actually make a difference.